Although fertilizer is essential for producing food across the globe, crops take up on average only 40 percent of the nutrients applied to them each growing season. The remainder can run off and pollute water and air. Runoff from row crops (corn, soy, wheat, etc.) can lead to algae blooms in lakes, rivers and the Gulf of Mexico. This outgrowth of algae renders drinking water unsafe and kills countless fish, leading to "dead zones" devoid of oxygen. The best solution is the one that most efficiently solves the problem on a large scale, and provides incentives for businesses to become more sustainable. We'll substantially reduce fertilizer as a pollutant in American agriculture and save farmers money. Matt Carstens, Senior Vice President of SUSTAIN at Land O'Lakes Inc.
We're doing this by increasing demand for grains grown using optimal fertilizer and best practices for soil health by addressing every point in the supply chain. Our goal is to change the way all grains are produced in the United States. 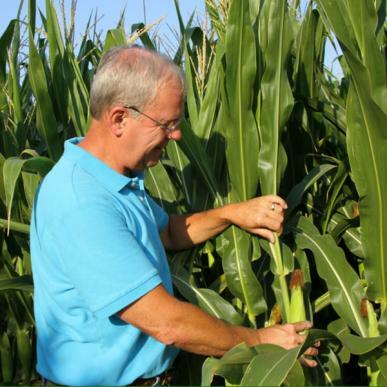 Technology now enables farmers like Len Corzine, of Illinois, to apply just the right amount of nitrogen fertilizer. Example: We worked with Walmart, one of our largest corporate partners, to set aggressive greenhouse gas reduction goals. One way the retailer is meeting this goal is by asking suppliers to cut emissions via better fertilizer use. Walmart's enormous purchasing power makes it worthwhile for suppliers to comply. So far, over 15 food companies representing 30 percent of the U.S. food and beverage market have committed to using fertilizer more efficiently. At the same time, farmers are seeing the benefits of improving water quality and soil health. Reduce fertilizer loss by an average of 25 percent on 750,000 acres across the U.S., while maintaining or increasing crop yields. Improve soil health to reduce erosion and better replenish groundwater. Implement conservation practices, such as cover crops, to help protect farms from the effects of extreme weather. "Growers are beginning to understand the need to build resilience into the system. We've had so many floods in the Midwest that no one knows what is normal any more," explains Matt Carstens, of Land O'Lakes, which is improving fertilizer use and soil health on 10 million acres. This, in turn, unleashes a cascade of demand for fertilizer-efficient crops that extends throughout the supply chain, from grain buyers, agribusiness companies and to the original source: farmers themselves. Thanks to new technologies and programs, farmers now have many different tools to help optimize their fertilizer use.